This post is not for the fainthearted! I’m warning you! Graphic image loading! At work the other day, the janitor opened the cleaning closet to pull out his mop bucket. “Hey, come here! Look at this!” he hollered. This is the honkingest, hugest, monstrous-est wolf spider I have ever seen. 😯 I dropped my pen in the bucket for scale, and snapped a photo. The creature scowled at me and lifted its hairy, meaty hooks in revenge. I’ve seen a lot of spiders in my day. Garden spiders get this big. But THIS creature… what is it, a freak of gamma rays or something? The janitor and I both squealed in excited fright. I told him to get rid of it. With a look that said “Goodbye, dear friend,” he wheeled the bucket outside to kill the intruder. “How it’d go? Did it make a loud *pop* when you squished it?” I maliciously cackled. I said nothing. I just stared. YOU LET HIM GO?!?!? I mouthed slowly. YES, he mouthed back. His own life was spared because at that moment, a customer walked in…. I forgot about the spider until yesterday. OH, that fateful day. “Hey, come here! Look at this!” the janitor yelled. Naively, I trotted over. I glanced at some large black thing scurrying across the floor. The spider, sensing my mood, scampered toward the safety of a large case. THE CASE WHERE I FREQUENTLY SORT MAIL. In desperation, I kicked the monster with my foot away from my work area. If that critter was able to hide beneath all my boxes and stuff, no telling what he’d do when I was alone in the building. When I kicked the thing, I swear the spider growled at me. It lifted its two front talons and spun them at me. Oh, God. 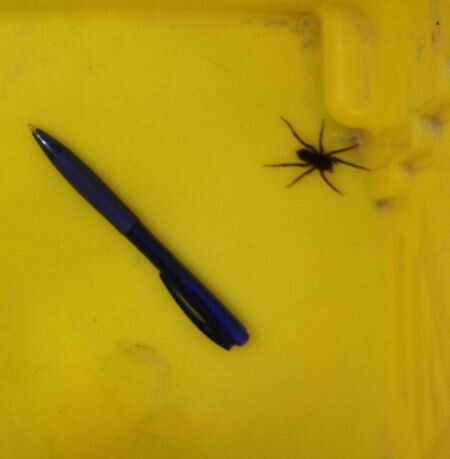 I could see the headline now: Postal Worker Snuffed Out By Giant Spider in Strange Vengeful Attack… Spider seemed perfectly harmless to me, janitor says…. “Get him out of here!” I ordered the janitor. A customer walked in (dang, what IS it with customers all of a sudden?! Don’t they know?!). I threw up my hands in exasperation. “I’ll take care of it,” janitor says. After rushing the customer through the transaction, I hurry back to the scene to find the janitor lounging on his broom (he’s union). Tears well up and I begin to sob. “My life is over,” I say. Janitor pats my shoulder. “I’ll make sure the mail goes on,” he says. I come home later, exhausted, and relay the story and the size of the creature to my kids. I show them my photo. “Look at the pen next to it,” I say. I can’t get over how huge the spider was. Is. WAH!